Driving up the driveway of this large property, past immaculate, manicured gardens with a gently trickling water feature, against the background of the mountains of Constantia, you can’t help but feel calm and relaxed. Creating the atmosphere of a French Provencal-style villa or chateau, done in an upmarket, tasteful way, the owner wanted a house that would not date, with a more traditional feel based on European design; a house with the “wow factor”, and one that maximised the view of the vineyards and surrounding areas. The location was chosen for its tranquillity, the trees, the winelands and the birdlife. “Cape Town is a beautiful city,” he muses, and the property is far away from the hustle and bustle. Based on his experience in the hotel industry, he chose to create rooms that resemble a presidential suite. From their journey through France and America, the owners have managed to hand-pick a few choice pieces of furniture. Most of the furniture is solid wood, well crafted and more traditional in style, many with ornate detail. The grandfather clock from Zimbabwe is one of the couple’s special pieces. The owner credits his wife for the interior decorating, choosing her own furniture and accessories to create the character of the home. On the exterior, a great deal of attention has been paid to details such as precast mouldings, wall and plaster finishes. Many of the features of the house were based on American architecture, but recreating that style was no easy task. One of the biggest challenges was the earthworks; the house is built on a slope and on more than one level. The pool was another challenge, as was the acquisition of various finishes, such as the fireplaces, with each fireplace individually designed. Upstairs, there are five bedrooms with en-suite bathrooms. The main bedroom features a high bed, plush carpet and ornate mirrors, giving the impression that one has stepped into a French villa. The library, with its ornate doors, stepladder leading to the shelves and pictures of the Anglo-Boer War, is the perfect place to relax with a good book. 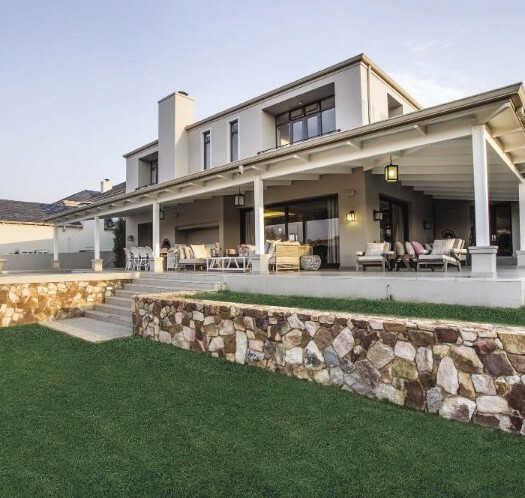 The house also features an open-plan kitchen, dining room, lounge with double-volume area, wine cellar, home theatre, tennis courts, playroom for grandchildren, and a summer house with braai area. The project took about two years to complete, with the home owner spending eight hours a day on site. He advises that it is important to know what you want, such as the height of the ceilings, as opposed to merely accepting what the architect designs. Getting good builders is another good piece of advice. This process is time-consuming and one has to be involved at every stage, he says.